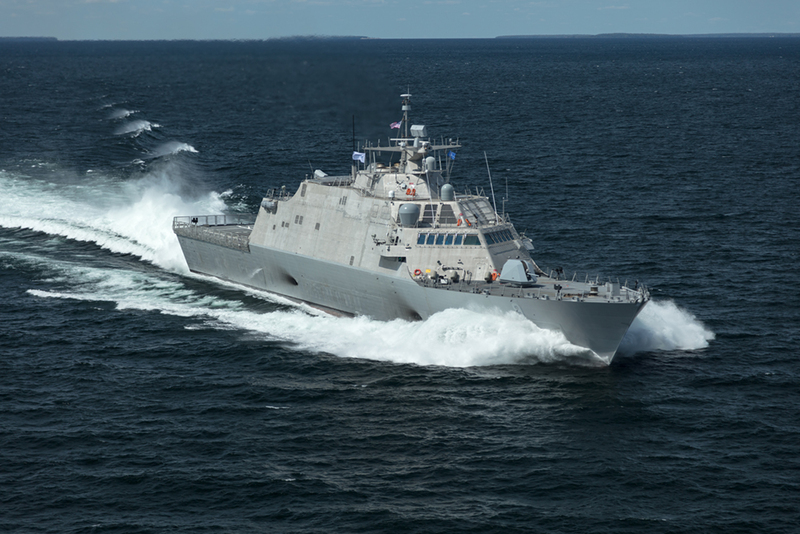 BUFFALO, NY – There’s a saying about punctuality – “If you’re on time… you’re late.” The crew of the US Navy’s newest littoral combat ship, the future USS Little Rock LCS 9, are taking that saying seriously. Originally scheduled to arrive at Canalside in Buffalo on Friday December 8, the ship is now scheduled to arrive four days early on Monday, December 4 at 9:00am. The Commissioning Ceremony for the future USS Little Rock LCS 9 is schedule for Saturday, December 16 at 11:00am at Canalside in Buffalo NY. This date has not changed. “With the early arrival, people will have four extra days to get a look at this state-of-the-art warship.” comment Maurice L. Naylon III, chairman of the USS Little Rock LCS 9 Commissioning Committee. “We’ll also have four extra days for the men and women of LCS Crew 109 to experience all that Buffalo and Western New York has to offer.” The Commissioning Committee is working on plans for an official “welome party” for the ship when it arrives on Monday. Naylon said the all-volunteer Commissioning Committee has been hard at work for months planning for the ship’s arrival and the varous events during Commissioning Week – December 8 – 17. The fact that the ship will be in Buffalo four days early will not interfere with the committee’s plans or the Commissiong Ceremony. Tickets for the Commissioning Ceremony on December 16th are sold out, however the general public is able to see the USS Little Rock LCS 9 while the ship is docked at Canalside. A schedule of events for Commissioning Week is available at www.usslittlerocklcs9.org. Canalside will be open during the Commissioning Week so the general public can view LCS 9 without a ticket. Canalside streets will be closed to vehicle traffic and visitors are encourage to use the NFTA Metro Rail to get to Canalside for Commissioning Week. Canalside will be a secured area and anyone visiting Canalside during Commissioning Week will be required to pass through TSA type security screening. This event is historic for LCS 9, her crew, the Navy and all of Buffalo and Western New York as this will be the first time in the 242-year US Navy history, that a new ship is commissioned alongside her namesake – the original USS Little Rock, now on permanent display at the Buffalo & Erie County Naval & Military Park. This ship was in service from August 27, 1944 until her decommissioning in November 1976. The Buffalo Naval Park will also be open during Commissioning Week giving people a once-in-a-lifetime opportunity to see both ships. 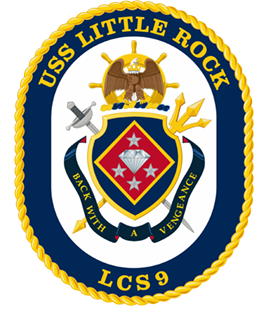 The USS Little Rock LCS 9 Commissioning Committee is an all-volunteer effort responsible for the oversight and organization of activities in support of the Commissioning Ceremony. In addition to organizing, managing, funding and producing the activities and events for the Commissioning week, the Committee is charged with raising money to fund a number of scholarships and initiatives. Net proceeds will benefit scholarships for students in our community as well as provide financial support for the decommissioned USS Little Rock on permanent display at the Buffalo & Erie County Naval and Military Park. The mission of the committee is to pull-together a first class event – something fitting of the historical significance of this commissioning. Support for the Commissioning Committee comes from The Buffalo Renaissance Foundation, Try-It Distributing, Charles F Kreiner, Jr., American DND, MOOG, Rolls-Royce, West Herr Auto Group, Lockheed Martin, Dunn Tire, Basil Auto Group, New Era Cap, Lawley and Acquest Development. More information the USS Little Rock LCS 9 Commissioning Committee can be found at www.usslittlerocklcs9.org. USS Little Rock LCS 9 Commissioning Committee social media accounts include: Facebook: USS Little Rock – LCS 9, on Twitter: @usslittlerock9, and on Instagram: usslittlerocklcs9.